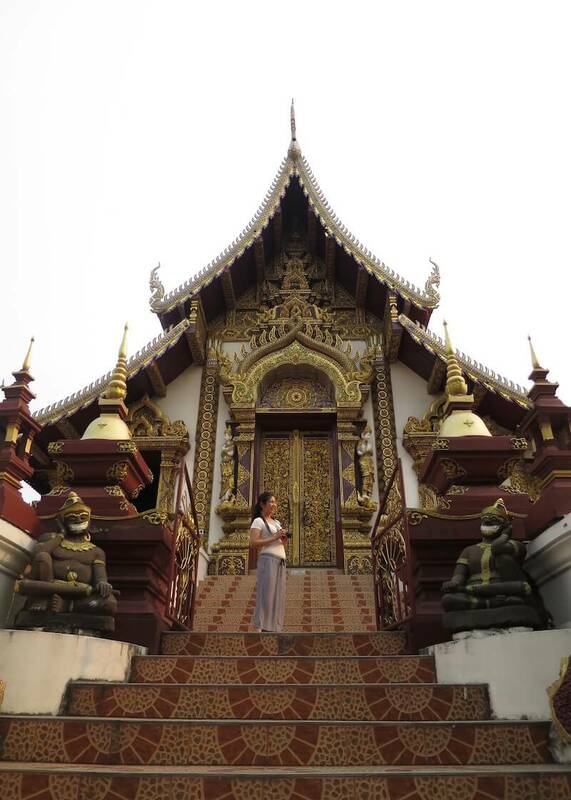 After starting our two-month trip beginning on the southern beaches of Thailand, we took the train to go to our last destination: Chiang Mai. Little did we know at the time, Chiang Mai would become our home away from home. 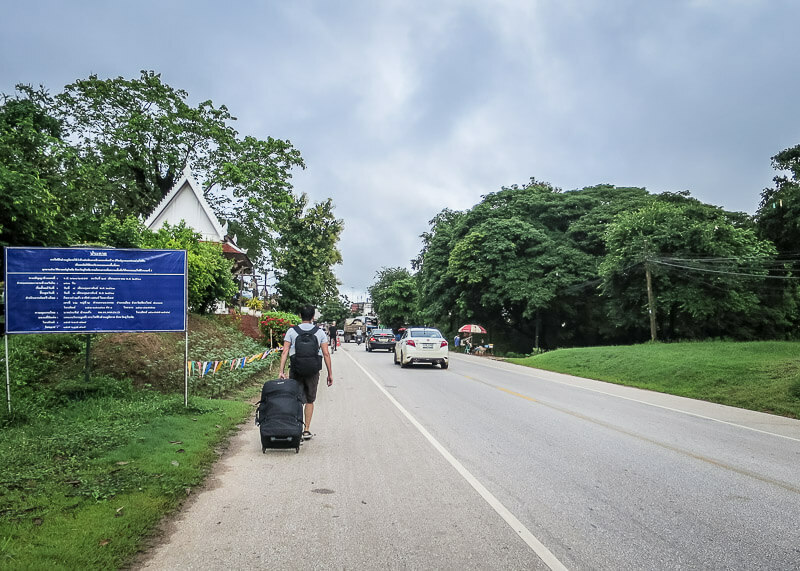 After spending three weeks in Chiang Mai, we came back to spend another three months in Chiang Mai, but that’s another story. 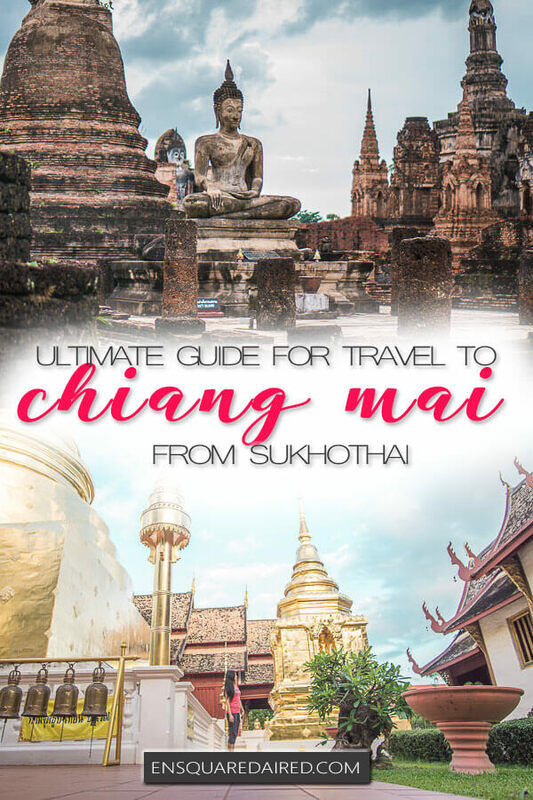 There are quite a few options to get to Chiang Mai from Sukhothai. 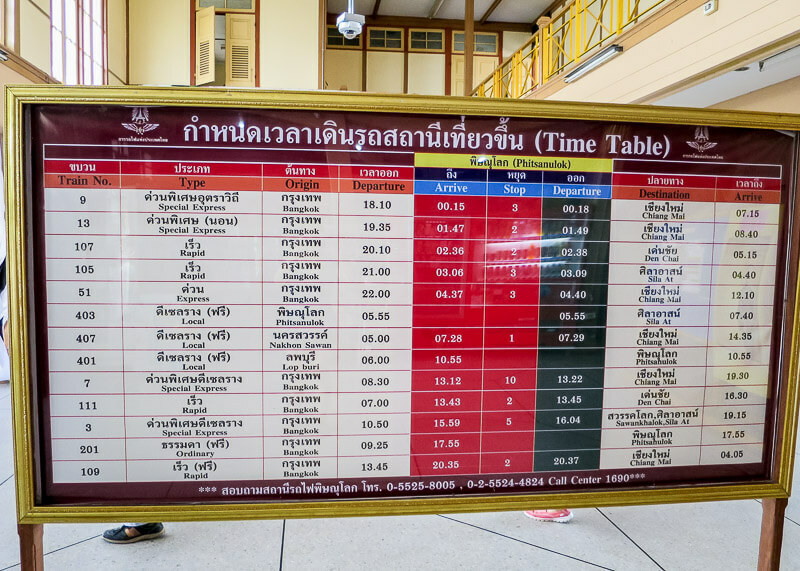 After looking at our pros and cons, we decided to take the train from Phitsanulok to Chiang Mai. Honestly, driving in Thailand is quite scary (even if you’re a passenger) so I prefer that we avoid road travel where possible. When you get on the train and see the stunning views of the jungle, you’ll appreciate why the train to Chiang Mai is the best route to take. How do I book the train tickets? We found the station and bought tickets on the day of departure. 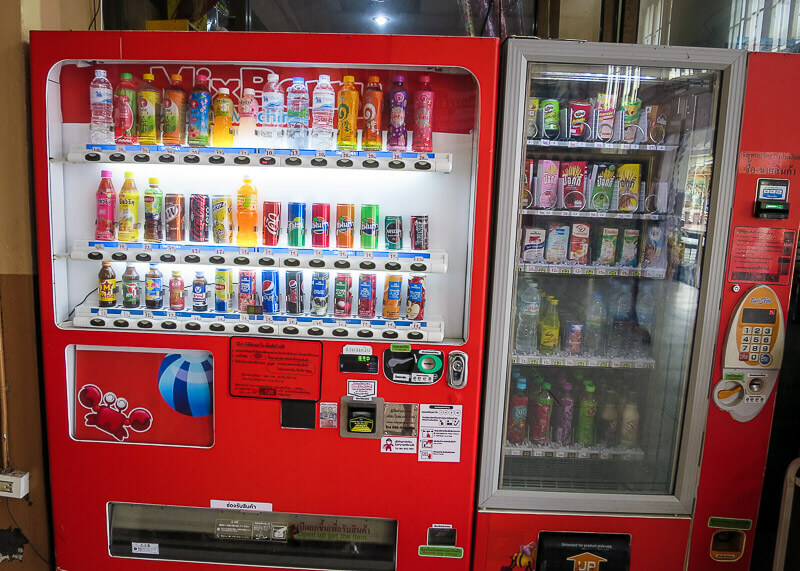 We could have bought the tickets the day before, but when you see the bus terminal, you will know why we were hesitant to buy our tickets in advance. 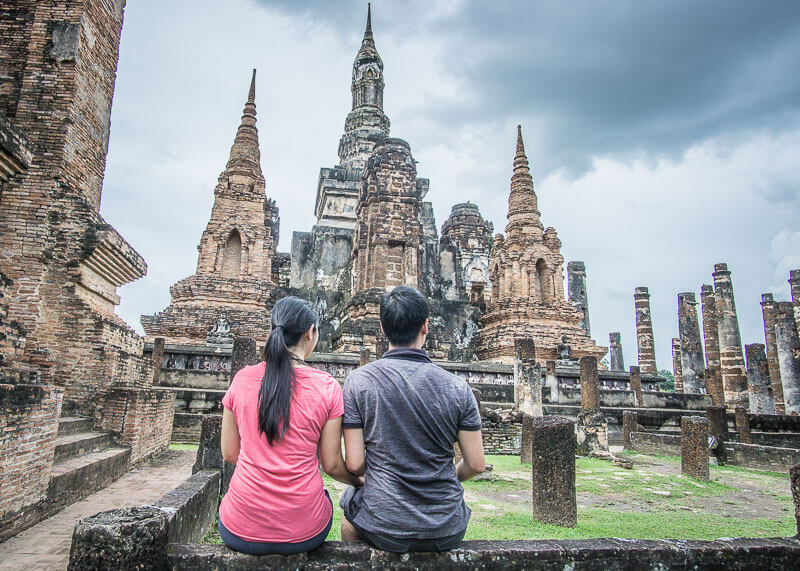 What happens on the day of our trip from Sukhothai to Chiang Mai? We woke up early to walk to the bus station, which was about a ten-minute walk from our hotel. In case you want to see what the bus terminal looks like, here it is. Even though it seems quite sketchy, it is a legit bus station. When we were told to get to the bus station by 8:30 am, we weren’t quite sure if he meant that the bus would leave at 8:30 am, or that the driver will arrive at that time. Either way, we were surprised to see that the bus was already waiting for us at 8:20 am. We left at 8:22 am and had a scenic drive from the Wintour station to the bus station in Sukhothai. 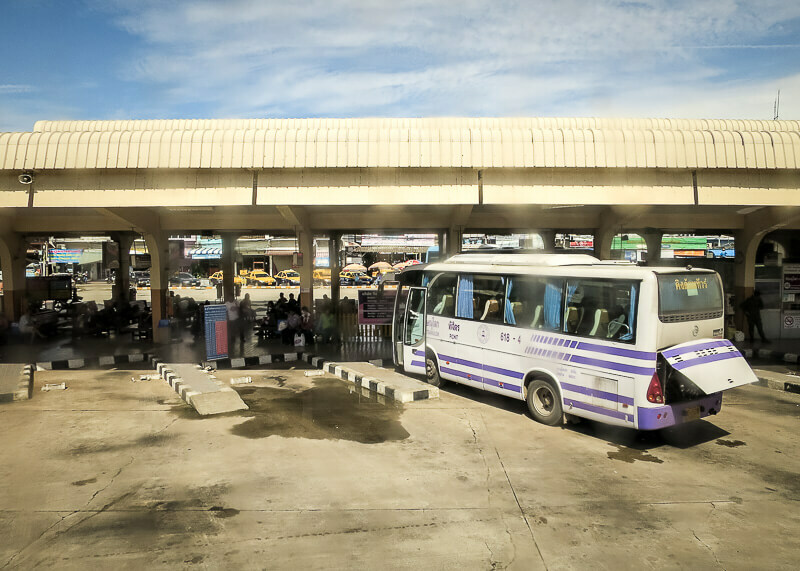 While the bus ride to Phitsanulok shouldn’t take more than an hour, the trip was close to two hours because of the multiple stops. Luckily, the bus ride was very comfortable, so we passed the time by listening to podcasts. There are seatbelts as well, which is something that’s uncommon in Thailand buses. Finally arrived at the Phitsanulok bus station! 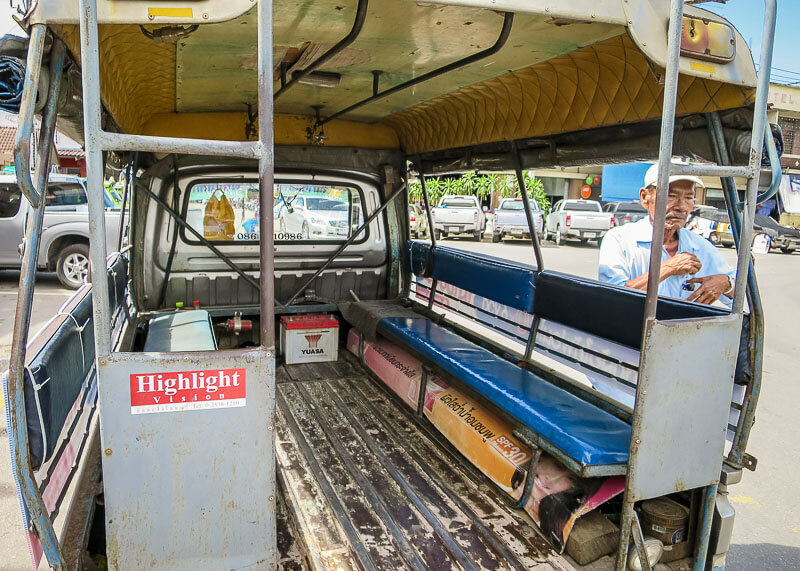 We finally arrived at the Phitsanulok bus station where we took a quick bio break and found a Tuk Tuk driver to drive us to the train station. The cost was 60 baht. I don’t know why but all Tuk Tuk drivers tend to congregate together. As they saw us walking towards them, all the drivers kept waving for us to go with them. Of course, we ended up going with the one who made an effort to stand up and guide us to his Tuk Tuk. The Tuk Tuk driver was kind and not scammy at all. He quoted the right price, and when we got to the train station, he wished us good luck on our journey. This experience is a reminder of why I love visiting destinations that are less touristy. I’m an obvious tourist at the station taking photos of everything I see, including this sign. A staff member walked into my photo, paused and looked at the sign I photographed. He gave me this weird look because he didn’t see the significance of the sign and why it would be worth photographing. Only two hours in do we realize that there’s an air-conditioned coffee shop where you can charge your phones! Ughhhh!!! 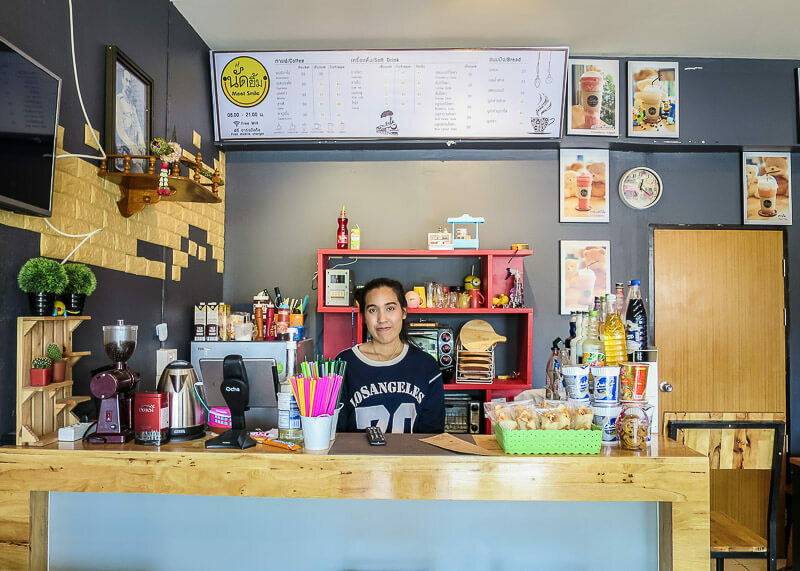 Phim, the owner of this coffee shop. Go visit her if you’re at the Phitsanulok train station at นัดยิ้ม: Meet Smile at สถานีรถไฟ! 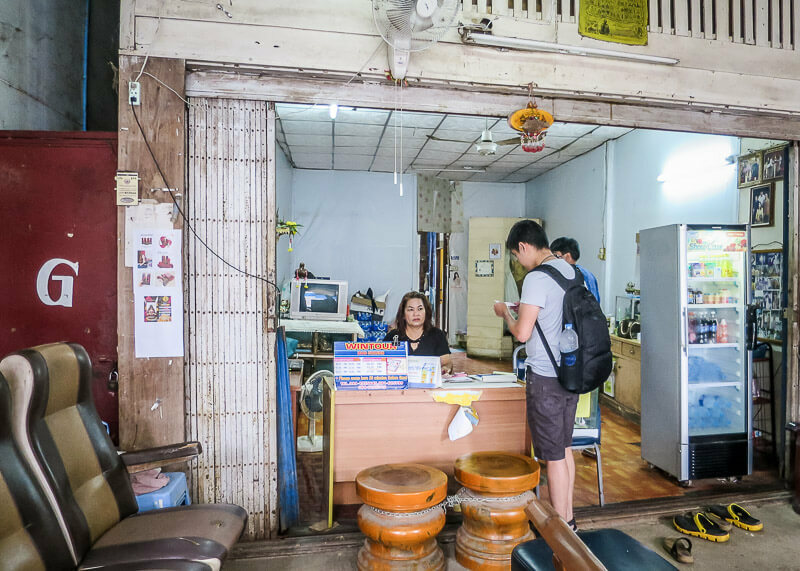 We met the owner Phim who just opened the coffee shop earlier in the year. We also met one of her friends, June, who studied to be a cooking instructor. June now owns a Thai cooking school in Phitsanulok to service tourists! Finally, our train arrives and it is time to visit Chiang Mai! Of all the train rides I’ve taken in Chiang Mai, this segment is the most beautiful. We saw sugar canes and rice fields with clouds reflecting from the rice ponds. As we travelled closer to Chiang Mai, the scenery starts to become more jungle-like. At some point, I was expecting to see an elephant emerging from the jungle because of the remote landscape. Wishful thinking – I saw no wildlife. Boo. I did visit an elephant sanctuary where they rescue abused elephants which you can read about in this post. 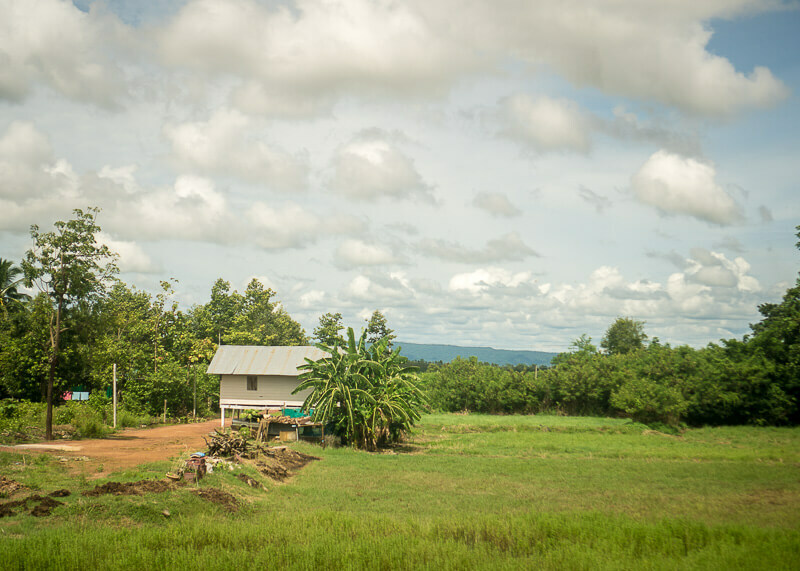 There were also traditional Thai homes as the train took us through remote areas of Thailand. I often wondered what the lives of the people in these homes were like and became curious about their stories. These dwellings brought memories of the days when I lived in the house that my father grew up in Asia. 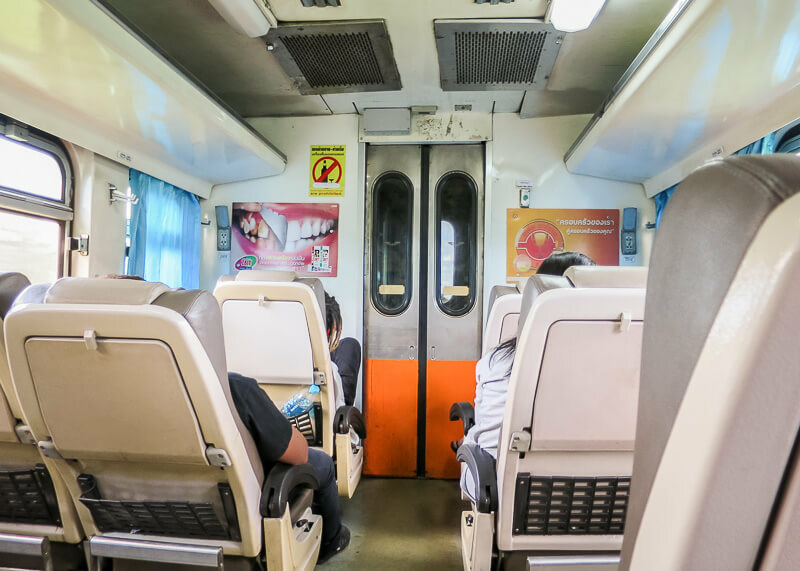 Did I feel safe while travelling from Sukhothai to Chiang Mai by bus and train? Despite all the horror stories I read online about bus ride in Thailand, the ride was smooth and very safe. The fact that they even had seatbelts on the bus was comforting to me. 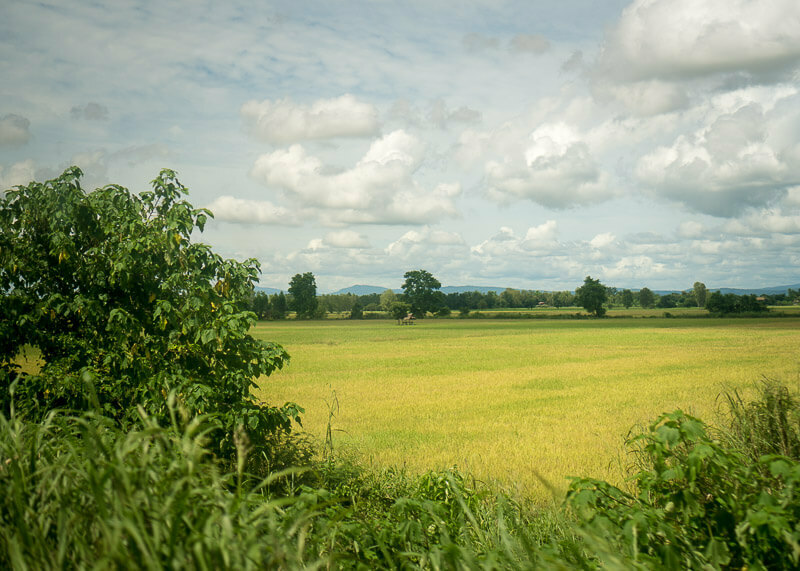 The train ride from Phitsanulok to Chiang Mai felt like the rest of the Thailand train rides. I’ve read stories of derailment but never had that experience on any of my train rides in Thailand. 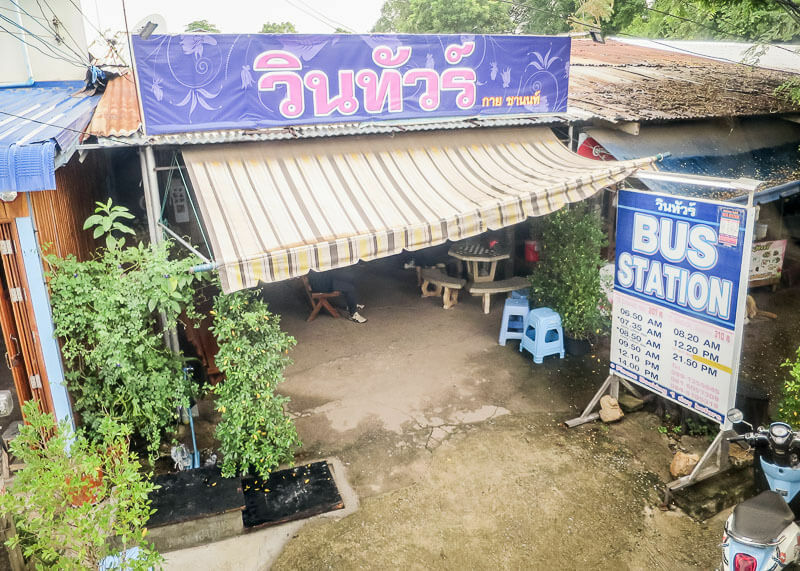 Can you charge your phone at any point during the journey from Sukhothai to Chiang Mai? 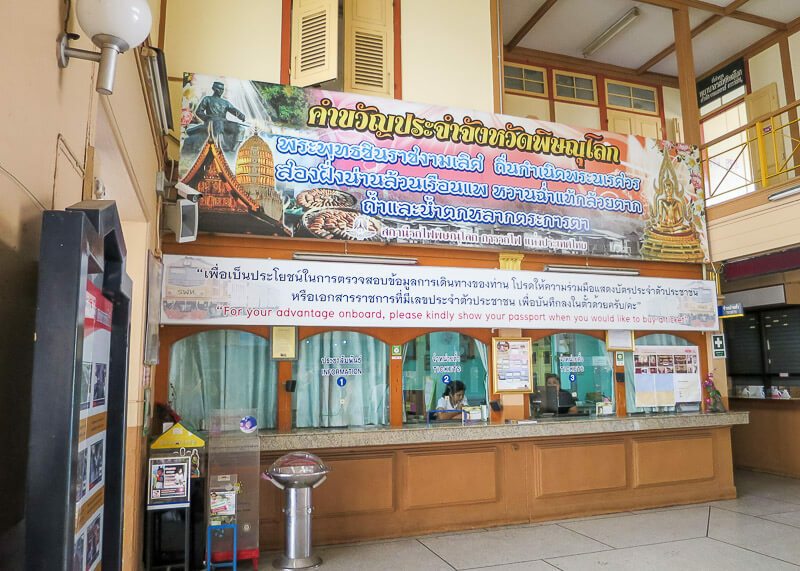 The only time we were able to charge our phone was at the café at the Phitsanulok train station. So I suggest you drink some delicious tea and charge your phone before hopping on the train. It was hard to ask questions in English during the bus segment, but the train was fine. The train attendants know good English and will confirm the destination and time. They will also give you a five-minute heads up before your stop so you can grab your belongings. 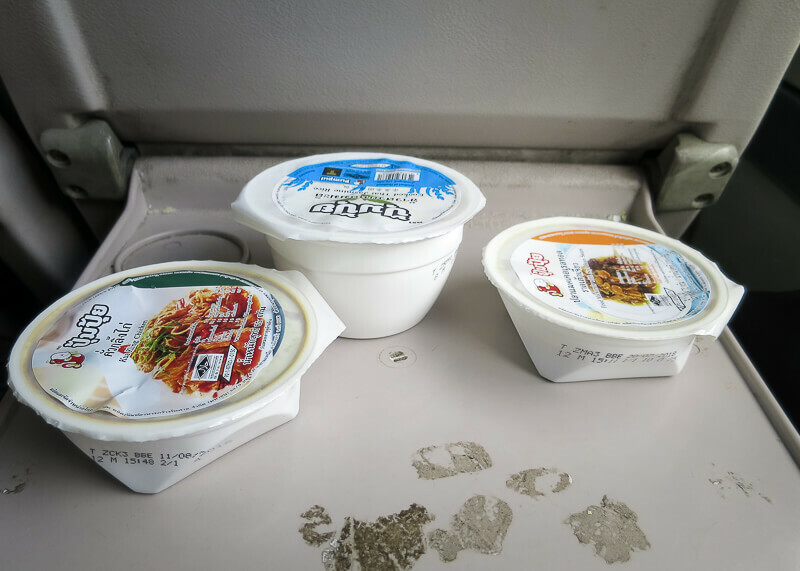 Like most of our train rides, our tickets came with food and water. What’s interesting is that a few foreigners around us refused the food and water. We later realized it’s because they were extra cautious. Where to keep your luggage and what are the storage options? When it came to bus travel, our suitcase was stored at the bottom of the bus. As for train travel, we had our big luggage kept at the end of the train carriage. While nothing happened to our stuff, I recommend getting a good suitcase because I have read stories about missing items during transportation. Note, these occurrences aren’t specific to Thailand. 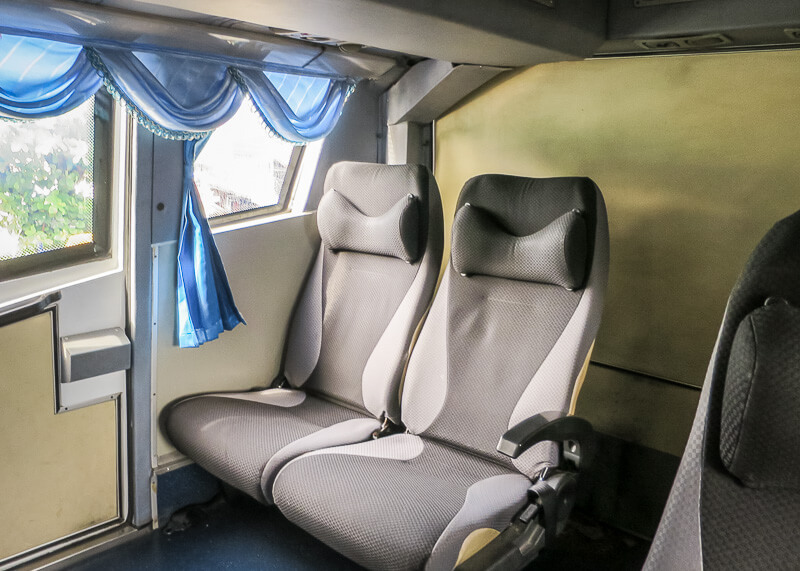 What were the facilities like on the train and bus journey from Sukhothai to Chiang Mai? The train has western toilets and squat toilets, and there’s toilet paper. The Phitsanulok bus and train stations have clean bathrooms, which you have to pay to use. Hey there! Good post. Any thoughts on the private driver from Sukhothai to Chiang Mai? I know it’s the most expensive way to travel, but we’d like to use the private driver but not sure what companies are reputable. Unfortunately, I don’t have anyone I can personally recommend. I suggest calling a high-end hotel in Sukhothai with good reviews and asking for their recommendations. The other option is to try calling an international hotel chain in Chiang Mai (i.e. Le Meridien, which I’ve personally booked tours through and trust because they are under the SPG brand). Their prices will be high, but they generally do a proper screening of the vendors that they partner with. The last resort could be to book through Klook (see link above in the post for price and details). Klook offers one-way transportation to Chiang Mai, and they are pretty responsive to questions. Whoever you decide to book with, make sure to ask if there are seat belts, air conditioning and any questions you can think of relating to safety. For example, you can ask if they are adequately insured, licensed and if they have rules for drivers (i.e. do drivers know not to speed and not to use their cell phone when driving?). If you can, try to book the transfer during the daytime as it seems that accidents are more prone to happen at night. This does help, thanks! This site is awesome! We’re just starting to look through the logistics of our trip, so this is all very useful. Thanks so much, Megan! Wishing you a safe and happy time in Thailand!